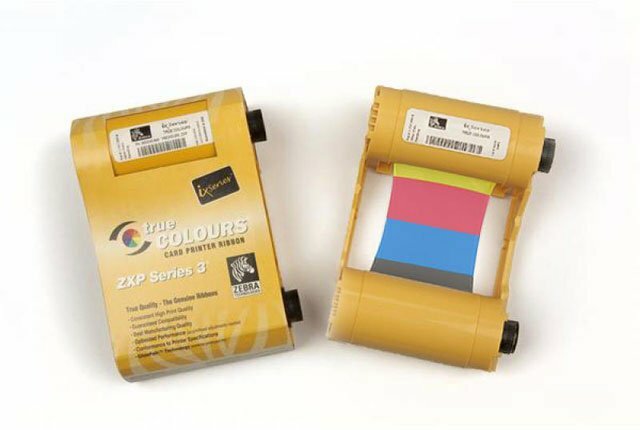 Zebra ID Card Ribbon - YmcKO (short-panel or half-panel) IX Series Color Ribbon for ZXP Series 3, 250 Image prints per roll. The ribbon allows for printing in a variety of colors 1/2 the length of the card: yellow (Y), magenta (M), and cyan (C), and a full card print in black (K). The remaining overlay (O) provides an extra clear layer of protection for the card. This ribbon is used to print text and full-color images on one or both sides of a card. Compatible with the ZXP Series 3. The Zebra 800033-847 is also known as ZCD-800033847	or 800033847	.